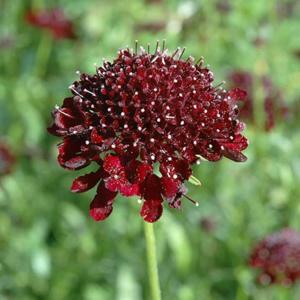 Very dark maroon, almost black, flowerheads with white tipped stigmas, borne on tall strong stems in mid and late summer. Fragrant. Ferny green basal foliage. Well drained, neutral to slightly alkaline soil in full sun. Dislikes winter wet and may not survive bad winters. Can be grown as an annual. By division. Also available as seed.